J. W. Chandler, who served as Grand Master of the Most Worshipful Grand Lodge of Texas for 1967-1968, was born at Falfurrias, Texas, on November 21, 1919. In 1930 he moved to Houston, Texas, where he attended public schools and Lamar High School. In addition, Brother Chandler attended Business College, Houston Vocational College and has completed numerous Extension and Correspondence courses in Accounting, Finance and Management. Brother Chandler, an accountant by profession, is President of Southern States Optical Company, Inc., in Houston. He is very active in community affairs, and is a member of the National Optical Wholesalers Association, Texas Opthalmic Dispenser Association, American Board of Opticianry, Houston Chamber of Commerce, and American Legion. In addition, Brother Chandler has served as President of the Southwest Association of Independent Optical Suppliers, and on the Advisory Board of the University of Houston, receiving the Outstanding Service Award from the College of Optometry, University of Houston, in 1959. During World War II Brother Chandler served in the United States Army. He is a member of the West University Methodist Church in Houston and has served on its Board of Stewards. On October 30, 1948, Brother Chandler was raised to the Degree of a Master Mason in Reagan Lodge No. 1037, Houston, Texas. He served this Lodge as Worshipful Master in 1955-1956. He was District Deputy Grand Master of Masonic District No. 30-B in 1961, and served on the Committee on Purposes and Policies from 1961 to 1964. Brother Chandler belongs to Will N. Kidd Chapter No. 424, R. A. M., having served as High Priest in 1957-1958, and as District Deputy Grand High Priest of District No. 5 in 1963. He is a member of San Jacinto Council No. 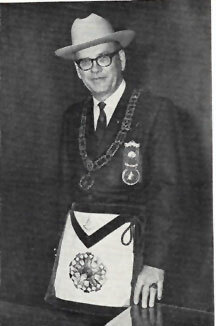 347, R. & S. M., and served as Thrice Illustrious Master in 1958-1959. Also, he is a member of Ruthven Commandery No. 2, Knights Templar, Arabia Shrine Temple and has received the Super Excellent Master’s Degree, the Order of High Priesthood and the Order of the Silver Trowel. In 1963, Brother Chandler received the Scottish Rite Degrees. He is a 32nd Degree Knight Commander of the Court of Honour, and is the Personal Representative of the Sovereign Grand Inspector General in Texas for the Valley of Houston. Brother Chandler has taken an active part with youth groups and is Chairman of the Advisory Board of Reagan Chapter, Order of DeMolay. He is a Past Worthy Patron of Houston Heights Chapter, Order of the Eastern Star. “We are all proud of the part Masons had in the formation of this great Republic of ours . . . in the drafting of the Declaration of Independence, the Bill of Rights and the Constitution, guaranteeing freedom of religion, the separation of church and state and forbidding appropriation of monies to private or parochial schools. The Masons of Texas are proud of the leadership, zeal and ability of Brother Chandler, and wish for him many years of continued service to the Craft.